NASA's In-Space Validation of Earth Science Technologies ("InVEST" for short) program has funded a team led by Lars Dyrud, a scientist at the Johns Hopkins University Applied Physics Laboratory in Laurel, Md., to develop a miniature instrument that will measure the amount of solar energy reflected by Earth and the amount emitted to space as infrared radiation or heat. The instrument will fly on APL's Multi-Mission Nanosatellite, a diminutive spacecraft known as a Cubesat, that measures only 4 inches wide and 13 inches long. A launch date has not been set; however, the mission expects to fly within three years. "Understanding this imbalance is the new Holy Grail," said Warren Wiscombe, a scientist at NASA's Goddard Space Flight Center in Greenbelt, Md., one of the team members. "It's the single-most crucial measure of climate change — much more reliable than surface air temperatures, which occasionally flat-line — and can foretell climate change in the pipeline. The imbalance tells us how fast the Earth responds to greenhouse-gas forcing and the relative roles of the oceans and aerosols in modulating that forcing." Widely cited papers by James Hansen, the former director of NASA's Goddard Institute for Space Studies, New York City, have concluded more energy is being absorbed from the sun than is emitted back to space, throwing the Earth's energy out of balance and warming the globe. In a study released last year, Hansen's team calculated that, despite unusually low solar activity between 2005 and 2010, the planet continued to absorb more energy than it returned to space. In particular, the team concluded that Earth absorbed more than half a watt more solar energy per square meter than it released, bringing the finely tuned system into a state of imbalance. Wiscombe based his findings on ocean temperature measurements from 3,400 free-drifting Argo buoys, which monitored temperature, pressure and salinity of the upper ocean to a depth of 6,560 feet. His analysis, along with other ground-based and satellite data, showed that the upper ocean absorbed 71 percent of the excess energy. The so-called abyssal zone of the ocean — between 9,800 feet and 20,000 feet below the surface — absorbed 5 percent, while ice and land absorbed 8 and 4 percent, respectively. "The fact that only 8 percent of the extra energy caused the vast amount of ice melting that NASA satellites have measured gives perspective on the size of this extra energy," Wiscombe said. 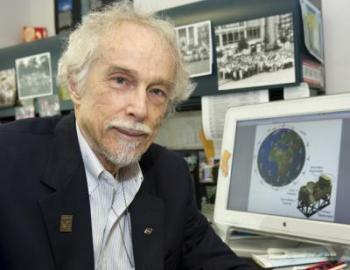 Pinpointing the magnitude of Earth's energy imbalance and its causes are fundamental to climate science, Wiscombe said. "Instead of just warming the air, the extra energy mostly warms the ocean, and the rate of change in ocean heat correlates with the imbalance," he said. In fact, surface temperatures, considered the gold standard in detecting global climate change, have, in fact, flat-lined since the great El Niño of 1998, which caused an unprecedented spike in warming. "This has caused us to rethink our way of thinking about climate change," he said "We need to focus on Earth's radiation budget, not surface air temperatures." With the InVEST funding, the team plans to demonstrate a new technique for measuring Earth's radiation budget. The team is building a radiometer — an instrument that measures the flux of electromagnetic radiation — and equipping it with a next-generation detector made of carbon nanotubes. The Vertically Aligned Carbon Nanotube detector is made of a thin layer of vertically aligned, multi-walled carbon nanotubes 10,000 times thinner than a strand of human hair. "If you want to measure outgoing radiation with the accuracy necessary to improve our predictions of global climate change, you have to make measurements everywhere, all the time," Dyrud said. "This carbon-nanotube radiometer allows us to do this accurately and in a small enough form that it fits in a Cubesat, which are necessary developments that make these measurements possible and affordable." Grown on silicon and other materials, these tiny hollow tubes are highly efficient at absorbing and trapping light across multiple wavelength bands — so efficient, in fact, that only a tiny fraction of the light actually escapes. Testing performed by Goddard technologists in 2011 revealed that the technology absorbed more than 99 percent of the light in the wavelength bands where Earth's energy is emitted into space. "I call this detector the roach motel for photons," Wiscombe said. "Light goes in, but it doesn't come out." With this application, radiation leaving the Earth, both reflected solar and emitted infrared, would strike the VACNT detector, which, in turn, would absorb the radiation and measure the change in temperature, providing scientists with a more comprehensive picture of Earth's radiation budget. The team plans to test the VACNT detectors this spring aboard a commercial suborbital vehicle that takes off and lands vertically. Obtaining funding to fly the radiometer on APL's tiny spacecraft is just the first step, however. The team believes Earth radiation-budget science ultimately will require scores of radiometers installed on massive satellite constellations, which would be more easily realized by flying the instruments on less-expensive Cubesats, Wiscombe said. Although NASA launched the Earth Radiation Budget Experiment in the 1980s, only three Earth-orbiting satellites hosted the ERBE payload. While ERBE helped scientists better understand cloud forcing and provided Earth's average monthly energy budget, Wiscombe said the satellites provided limited temporal sampling. Today, the situation is even worse, he said. NASA's current Earth-sensing spacecraft sample a given location at best only four times a day. In the future, this will drop to twice a day. The rapid fluctuations during the diurnal cycle due to clouds, for example, remain largely unobserved, he added. "Our satellites huddle together in near-noon, sun-synchronous orbits, leaving vast stretches of each day unmeasured by any low-Earth-orbiting satellites," Wiscombe said. "Yet every Earth scientist knows that the diurnal cycle is extremely important and quite large. The only way to properly observe diurnal cycles is to have every place on Earth visible from one or more functionally identical and calibrated satellites 24/7, and the best way to do this right now is with a low-Earth-orbit constellation. Our experiment is the first step in ultimately realizing this vision."